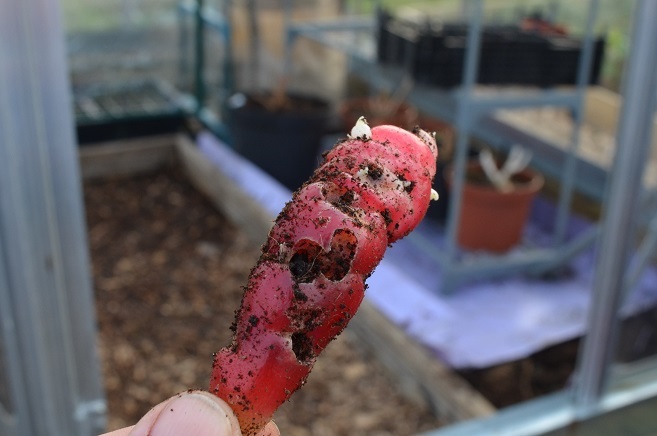 I put 4 oca tubers in a 40L bag, late last year as part of the experiment to see what difference it made to plant late. 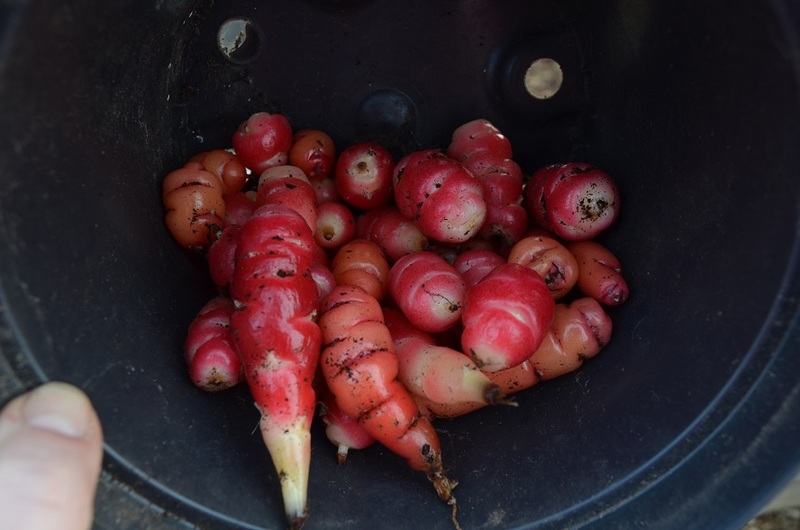 Lesson 1: late planting is not a good idea, not in a container, the tubers are much smaller and fewer. Lesson 2: bloody, bloody, BLOODY weevils! Vine weevils I think. 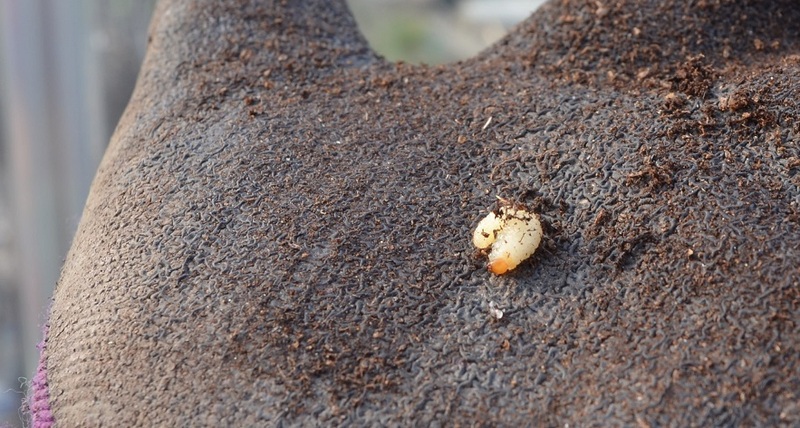 Fat white grubs with brown heads. I have a frankly pathetic harvest because nearly every tuber has been tunnelled out. It’s horrible to have to go through and pull out a ruined crop. More so because I’d been saving it for a late season treat. The compost is also now unusable for pots. It will be full of eggs, and even though I squashed every grub I saw, I will have missed some. So that’s out on one of the beds for the birds to peck through. And I need to find a way of sterilising the potato sack I used. It was a pretty good reminder that growing doesn’t always go to plan. 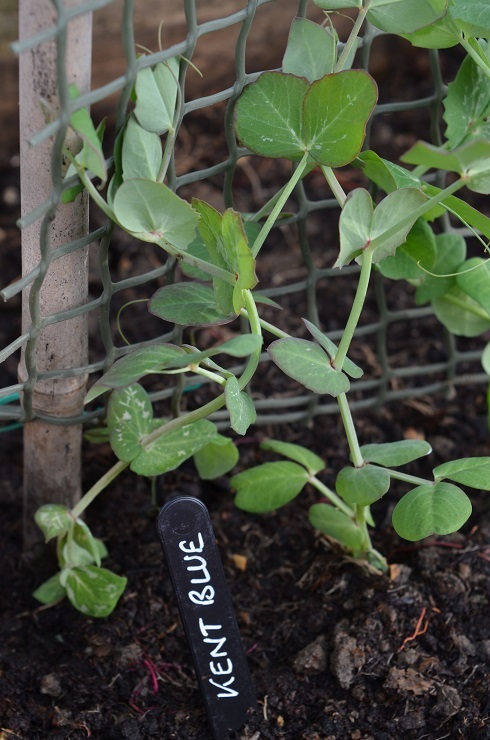 A line of Kent Blue peas seem very happy inside and are already scrambling up mesh. Six slugs made an appearance too. I imagine they are regretting this from their new location in the brambles over by the pond. On clearing out pots I discovered last year’s piquante chillies had grown through and into the bed, so, in case there is still life there, they are now planted out properly. They had to be moved – my staging sets are gradually being reinstalled. 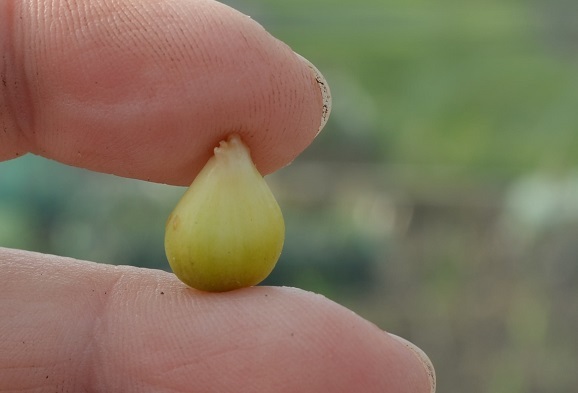 On the first at the moment are some cape gooseberries which might still be alive, a whole heap of purple-podded peas and pots filled with beans for a Heritage Seed Library experiment. Essentially this is a test to see whether field beans taste as good as standard broad beans. When you sign up unfortunately the website doesn’t say whether you’ll be sent beans, or whether you are confirmed as participating. Or my eyes skipped that bit…either way I assumed not on both fronts last year. As well as the 40 beans I now have from HSL, I already have close on 40 Wizard beans in the ground from a winter sowing. Wizard beans are…yes, you’ve guessed it…field beans. D’oh! It’s a bit later than I wanted, but the first few potatoes are also planted – one bag of 3 Dunluce, 40L of compost/manure, a very healthy scattering of fertiliser and my very best wishes for a crop in 10 weeks. Having learned the hard way that I can’t remember cropping dates, it’s labelled with variety plus the date I can start furtling around for my first potatoes. In chalk pen, one of my favourite toys. At home the propagator is still full. I am itching to sow tomatoes, and patience has never been in my gift. 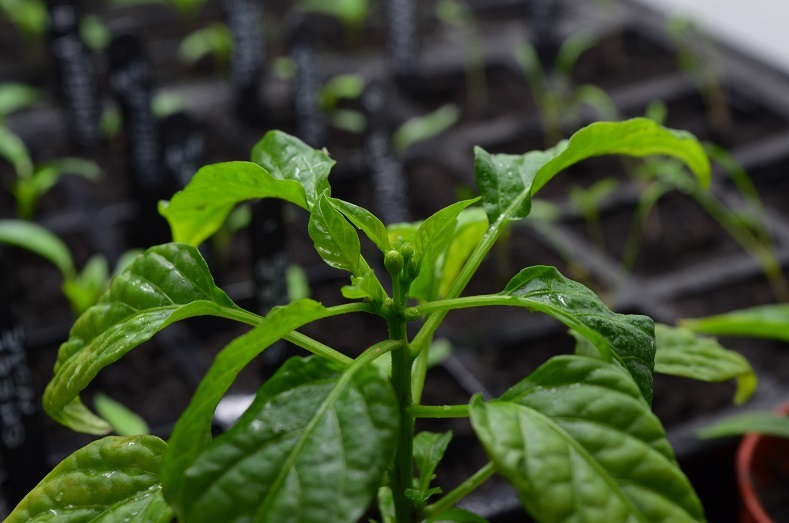 I even have the packets lined up and ready to go…The growlights are also full to busting – like a greenhouse, I think once you have them you can’t remember how you managed without them. One of the one-month old chillies, an Orange Wonder, is so happy in there it’s trying to flower. Already! As a note on the overwintering tomato experiment: it hasn’t gone brilliantly. The main, big plant died for no reason I could fathom. I have a cutting left, sitting in a glass of water and thinking about throwing out some roots. Looking after the plant was been a pain – it was sickly in my gloomy flat and it turns out that a break from nurturing plants is good for me. I can see that I would have early tomatoes, and for free, but I don’t think I have the temperament to try again. Now I have growlights I’ll stick to raising them from seed each year. I too have had a Vine Weevil attack, hope you can get rid of it. 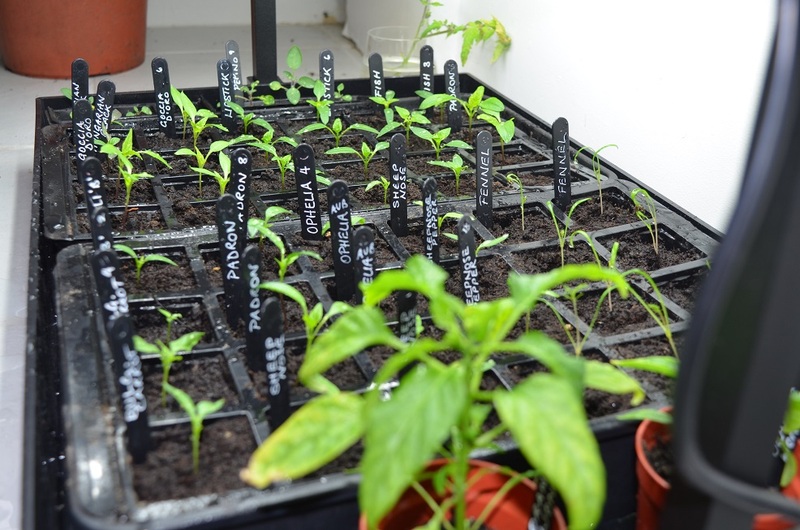 That’s an impressive crop of Chillies you’ve got coming along. Roll on Spring! Thank you! All spares are going to CroydonSaffron community garden so I won’t have to cull any. (hurrah!) Weevily compost will not be used again and tough-as-old-boots plants going in the bed I tipped it into. Hi Beryl, when did you sow your tiny beetroots? And out of interest, when are your first and last frost dates? 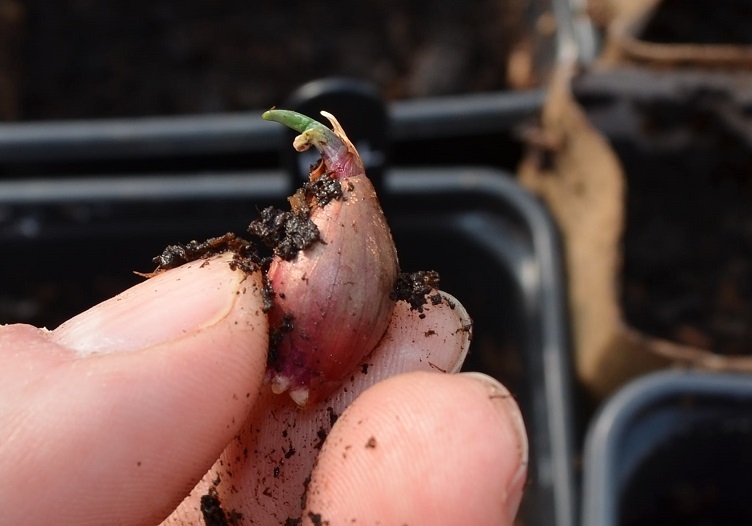 I sowed them in August & planted out in September if I remember rightly – it was a warm autumn and if I’d done it a month earlier I’d have had decent roots. Approx first frost early Nov and last frost approx mid-April – but those are MetOffice estimates and don’t always hold true. Plus being next to a cemetery means lots of open ground and unexpected low temps. Will be thermometer-watching from next month! Thanks. I’ve been trying to work out a planting schedule for this year and had been thinking about July for overwintering beetroot (Crapaudine and Chioggia). So that seems about right. (Sorry for picking your brains!) Our first frost is mid-October and last frost usually around 10 April, though last year it was mid-March, but we have had frosts as late as the first week in May. Mr Snoop and a friend have been out for a long walk today. It’s glorious at the moment. Neither of them can believe that we’re forecast snow tonight and tomorrow. Snow? If I’m not mixing Snoops – hope that doesn’t lead to more problems with the wet…(if I am, apologies!!) Am going to sow in early July this year -trying crapaudine for seed, likewise swede. Remembering not to eat them is the tough bit! Yes, same Snoop. Who knows what the weather will bring. It’s what I call “Lake District” rain out there at the moment: slow, steady and solid cloud for a sky, so it’ll keep this up for hours. So long as it stays slow and steady, I don’t mind. The ground will be able to absorb it. I had good germination with Crapaudine, much better than Burpees Golden, so will be doing the same. Thanks for the advice.